The post Hypothermia in Dogs: Symptoms, Treatment and How to Prevent It by Sassafras Lowrey appeared first on Dogster. Copying over entire articles infringes on copyright laws. You may not be aware of it, but all of these articles were assigned, contracted and paid for, so they aren’t considered public domain. However, we appreciate that you like the article and would love it if you continued sharing just the first paragraph of an article, then linking out to the rest of the piece on Dogster.com. Spring may be a few weeks away, but weather across the country is still cold and wintry. Freezing temperatures pose significant health risks not only to people, but also to our dogs. So, what should pet parents know about hypothermia in dogs? Let’s learn. First, what is hypothermia in dogs? What is hypothermia in dogs, and could you pup be at risk? Photography © damedeeso | iStock / Getty Images Plus. Hypothermia is a medical condition that occurs when a dog’s body temperature becomes dangerously low. Hypothermia in dogs happens when a canine’s body loses internal heat faster than his body can replace it and it can be very dangerous. If your dog has been out in the cold, it’s important to know what signs to look for with hypothermia and how to protect your dog. She also explains that hypothermia in dogs may initially present with an increased heart rate and breathing. However, as the hypothermia progresses, the dog’s heart and respiratory rates slow down dangerously. Any change in your dog’s heart rate and breathing is a cause for alarm and a reason to seek immediate veterinary care. How is hypothermia in dogs diagnosed? Hypothermia is all about the dog’s temperature reaching dangerously low levels. An average temperature for a healthy dog is between 101 and 102.5°F. Hypothermia in dogs is diagnosed based on symptoms listed above, as well as the dog’s core temperature being too low. A dog is considered to be in a state of hypothermia if his core temperature is below 99°F. What should you do about hypothermia in dogs? If your dog has been out in the cold and is experiencing the above symptoms or you are otherwise concerned your dog may have hypothermia, Rachel encourages dog guardians to do the following. “Do everything possible to make your dog warm and dry (warm blankets, dry towels, warm ambient temperature) and seek medical attention as soon as possible,” she advises. Hypothermia in dogs can be fatal. In terms of recovery, a lot is going to depend on how long it takes for a dog to receive veterinary care, and the severity of the hypothermia. “The colder the dog gets, the worse the prognosis,” Rachel says. In addition, a dog’s age and the length of time the dog’s temperature remains too low can also impact the dog’s likelihood of recovery. If you think your dog is experiencing hypothermia, get your dog to a veterinarian as soon as possible. Rachel describes veterinary treatment for hypothermia in dogs as involving a vet team carefully and gradually rewarming the dog through the use of blankets, warm IV fluids and oxygen supplementation. What canines are most at risk for hypothermia in dogs? While all dogs are at risk for hypothermia, the risk of hypothermia in dogs is highest for dogs who are medically fragile, as well as puppies and senior dogs. These dogs are most at risk because they have the hardest time with thermoregulating. Preventing hypothermia in dogs is possible. 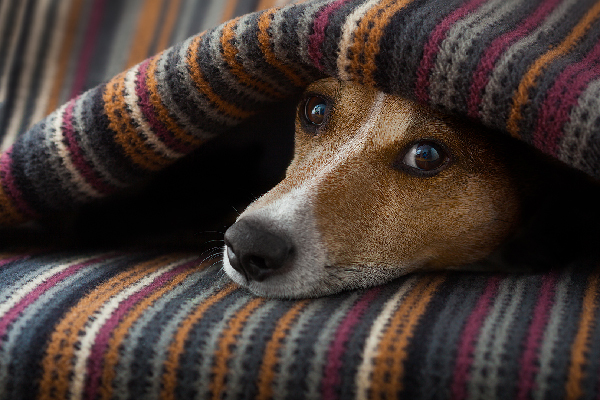 The best way to stop hypothermia is to ensure that dogs are kept warm during colder weather. Stay aware of severe cold weather advisories in your area. When it’s cold outside, put jackets and other warm, protective clothing on hairless dogs or dogs with short coats, as well as young and senior dogs. It’s also important to limit the time dogs spend outside when temperatures plummet. Some jurisdictions around the country are even beginning to legislate against dogs being kept outside in inclement weather for any length of time. Hypothermia in dogs can also occur during surgery when a dog under anesthesia is unable to thermoregulate as they normally would. For dogs undergoing surgeries involving general anesthesia, Rachel advises dog guardians to ask the vet what measures they will take to prevent hypothermia during the surgical procedure. Thumbnail: Photography ©GROMOV | Getty Images. Do Dogs Have Belly Buttons?